Assuming E-mail is the original social network, this Web 1.0 tool continues to have a large role in how we communicate and share ideas. With the exception of the clear GMail/Buzz integration or the recent Outlook/LinkedIn tie-up, for the most part, e-mail has not been dramatically revamped to take advantage of today's faster-moving, highly featured social networks. But despite e-mail's longevity, some basic attributes of the form continue to cause trouble between contacts who haven't mastered their core functionality. One of the most troublesome, the infrequently used, but often abused, BCC. With BCC, the recipient doesn't know all who got the message. As you no doubt know, BCC stands for "Blind Carbon Copy", providing a way to send e-mails to people without revealing their e-mail addresses. This can be an aid for mass mailings without exposure, but also used to be sure an individual gets a note without the direct recipient's knowledge. Often, those BCC'd blow the cover of the messages' routing. 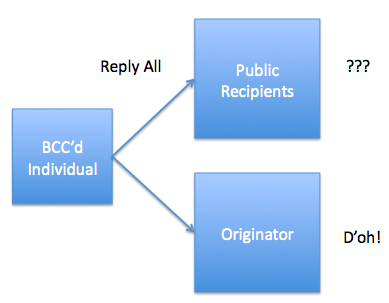 Some e-mail clients (such as a BlackBerry) will automatically make it clear to the recipient that they were BCC'd on a conversation, which hints they should not reply all. But not all people are as discerning and recognize their role in the world of BCC to be a silent observer. I know that when I get a BCC message that any reply I provide goes to the originator and not to the others in the thread. 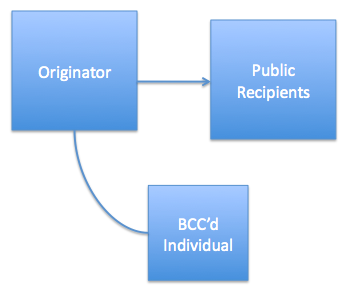 Given my goal to be public about communication, my own use of BCC is extremely infrequent. Due to the potential issues that can arise as trust is perceived to be broken, I tend to follow up a BCC note to the individual saying "You were BCC'd. Make sure not to reply."